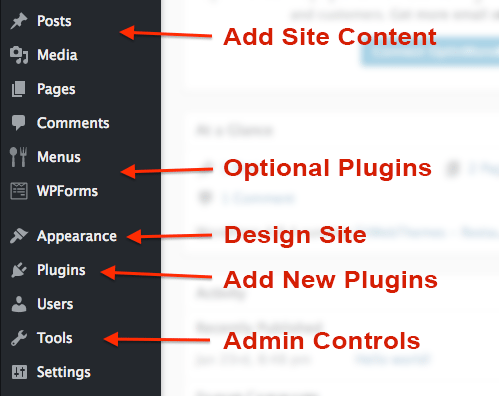 The WordPress dashboard is where users go to manage their website. Also known as the admin page or admin area, the dashboard is used to make website edits, view analytics, install plug-ins, add or remove contributors and more. The page is typically accessed by entering “/wp-admin/” to the end of your website URL. By default, the WordPress dashboard is your URL + /wp-admin/. For example, if your website is www.yoursite.com, then you would enter www.yoursite.com/wp-admin/. To log in, you’ll need a WordPress username and password. This should be supplied by your webmaster or, if you’re the owner of the website, your host provider. Login details are typically set the moment you create a hosting account, so check for a confirmation email if you can’t remember them. Top bar: If you’re running a blog, you’ll see a notification icon for new comments posted on your articles. Also, on the far right of the top bar is a link to edit your WordPress profile or log out of WordPress. Sidebar: Navigate between various menus to edit and manage your website. For example, click “Pages” to create new website pages or “Appearance” to customize your WordPress theme. Body: The main controls of the admin page. When you first log in, you’ll see notifications, recent activity and other updates. This screen changes depending on the menu selected on the sidebar. Posts: If your website includes a blog, use this menu to write, edit or publish new blog posts. Media: Upload photos, videos and other files. Pages: Create new website pages like your “About” or “Contact” pages. Comments: If your website includes a blog, use this menu to moderate and reply to visitor comments. Menus and WPForms: This is where user-installed plug-ins will appear. For my example website, I installed a restaurant menu plug-in and a form designer plug-in. Appearance: Adjust the design of your website, including color schemes, fonts and formatting. This is also where you can install new WordPress themes. 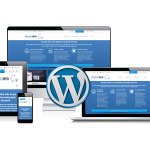 Plug-ins: Install new WordPress plug-ins to add more functionality to your site. Examples include contact forms, newsletter signups, appointment booking integrations and much more. Users: If multiple people work on your website, use this menu to manage their user accounts. For example, a “Contributor” user account means others can write and edit blog posts but can’t make edits to your website appearance. Tools and Settings: Additional admin controls like changing your default language and time zone. If you don’t see the above links, it means your account role needs to be changed to “Administrator.” Ask another user who is an administrator to make this change on the “Users” menu. The WordPress dashboard or admin page can be confusing at first. However, most users only need to use two or three menus on a daily basis. 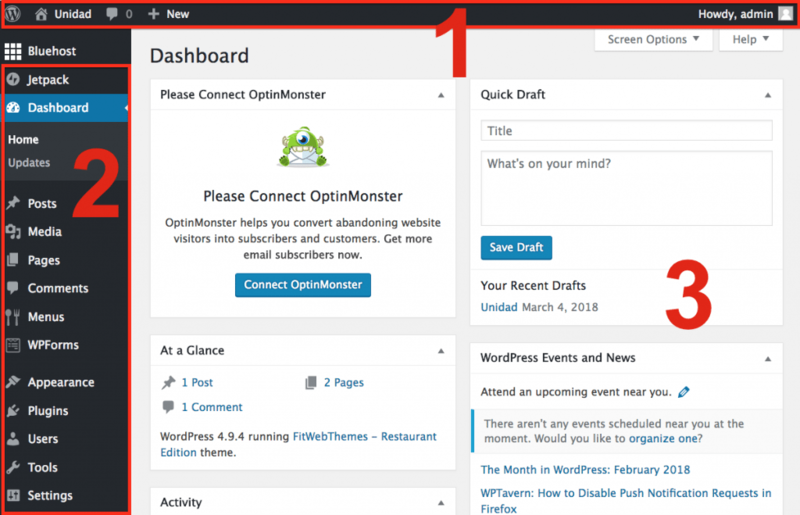 Once you grasp where they are and how to use them, the WordPress dashboard is a cinch to use. 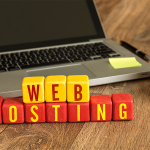 For more advice on creating a WordPress website, be sure to check out our full guide which covers everything from choosing hosting to setting up a theme.